The 'Free Meek' rallying cry started months ago when Meek Mill was unjustly sent to prison for 2-4 years. Meek Mill is now free and he stopped by Crossover TV to discuss prison reform, the Sixers and more. Unless you were living under a rock for the past five months, you probably caught wind of the "Free Meek" movement, a rallying cry that was created with the goal of getting Meek Mill exonerated after he was sentenced to 2 to 4 years in prison for a parole violation. Public figures like Beyonce, Jay-Z and Rick Ross lent their words and resources to the cause, while Pennsylvania power players like Governor Tom Wolf and Sixers owner Michael Rubin also stepped in and used their influence to help Meek and affect the criminal justice system. Well, after months of work, Meek is finally free and he stopped by Crossover TV to speak with ​Matt Dollinger and Rohan Nadkarni about the whirlwind his life has become but also shed light on issues within the Philadelphia prison systems. Rohan Nadkarni: Joining us on the show today is a North Philadelphia native who is an advocate for criminal justice reform. His most recent album, Wins and Losses, debuted at No. 3 on the billboard 200. He's like John Wall because he just gives them and goes, welcome to Crossover TV, Meek Mill. Meek Mill: Thanks for having me, man. Nadkarni: It's had to have been such a whirlwind for you these last few weeks. You got out of prison and went to the Sixers game that night. What do you remember from that day? Meek Mill: The beginning was a blur. First of all, Kevin Hart and Michael Rubin came to see me in prison. The top officials at the prison gave them a tour so they actually came on the block to see what my cell looked like. So I had Kevin Hart in my cell, him and Mike. I said, 'It's crazy, right?' They were like, 'It could be worse.' What's worse than a jail cell? A casket? So they were trying to make me feel good while they were there. During the visit we had a good time and had a good talk. Hours later, I'm in myself watching the news, 'Meek Mill is up for bail.' Then another hour or two later I'm on a helicopter heading to the Sixers game. I get a haircut, shower in the locker room, walk out, ring the bell, the Sixers take Game 5 and we had fun. Nadkarni: Real quick, I have to ask because I was at a couple Sixers games. Every hits the bell so softy. You got to take a big swing, you know? 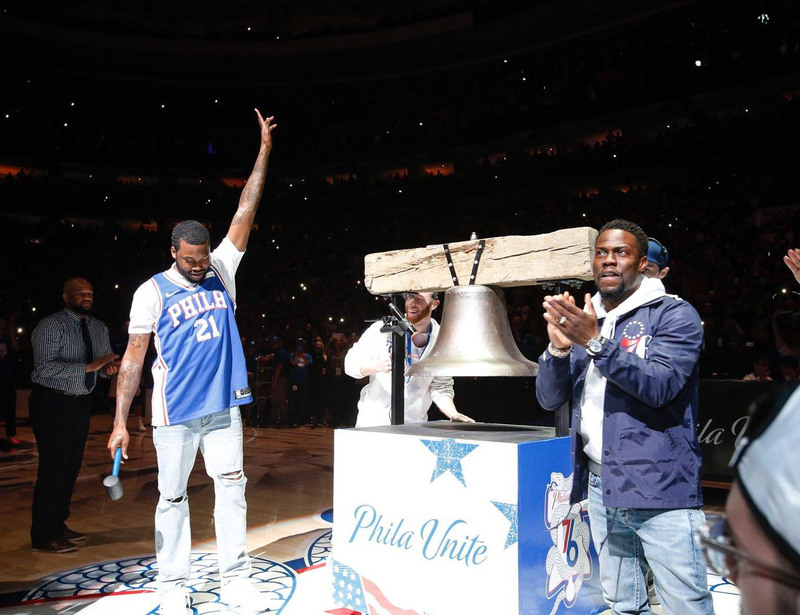 Meek Mill: Yeah, they tell you not to hit the bell like that. They don't tell you to hit it soft, but the top of the hammer is so heavy you don't want to swing it hard and break the whole thing. Matt Dollinger: That's not going to be good. That's going viral if you break the bell. It's been such a crazy transition for you since you've been out. Now you've become this big symbol for a lot of problems in this country and you're kind of the face of the criminal justice reform movement. What's that been like for you? Meek Mill: It's been a transformation. I just believe all this was put at my hands, and with all the support I got while I was in prison it felt right to step up and use all my resources to do what I do and try to make change. It doesn't hurt me to try to make change. I'm still going to be a rapper, I have to get back in the studio and talk a bunch of smack over a beat. Nadkarni: I think one of the things everyone who watches the NBA wants to know: They saw you at the Celtics game the other night. What were you, Robert Kraft and Gucci Mane talking about? Meek Mill: I was telling Gucci, I was like, 'Robert a real dude, man.' Seriously, I was like, 'He came to visit me in jail, he spoke out for me and he has a lot of influence. He's the real deal.' And Gucci already knew Robert before because he performed at the Patriots Super Bowl party—not the Eagles year, but the year before. He was saying how nice of a guy Gucci was and then Gucci came over and I was telling Gucci I respect Kraft. Dollinger: You had everyone on Twitter wondering what the hell you guys were talking about. Meek Mill: They were saying it looked like Gucci and I were about to fight and Robert was like, 'No jail rules.' I saw all types of funny memes. It was funny, too. I knew they were going to do that. Dollinger: You're such a diehard Sixers fan. How hard was it to follow the team from prison? Did Michael Rubin give you updates? Were you able to watch TV? Meek Mill: When you're in prison you get a TV in your cell. It's not luxury, it's never luxury. But you're able to get a TV and I kept up with all sports. I caught every game with the Sixers and most NBA teams. I got a chance to really lock in, because you know I spend a lot of time traveling on the road and I would miss a lot of games. Dollinger: It's good you got to watch them win some games after following those tough years. Meek Mill: I can't skate like he can skate. South Philly, they have a skating rink in their neighborhood. I'm from North Philly so I'd come down for the weekend or for the summer and they've been skating all year so I never really got a chance to catchup to them. Nadkarni: What's your favorite Dion Waiters story? Meek Mill: My favorite Dion Waiters story is Dion Waiters making it to the NBA. He's the first person I really saw rise above the ghetto and make it somewhere far. Me, I got on before him but I couldn't see myself because I was living in it. To see him go from walking to the basketball court. Because he's a little bit younger than us, we would be rolling by in a car and he's walking to shoot at the basketball court on 19th and Washington with his big duffle bag or you ride by the basketball court and he's the only one out there practicing and you know it's about to rain. It was just dope to see him grow up to be the person he is now. Dollinger: I know you've got so many new inspirations. Have you started writing songs or are you itching to perform? Meek Mill: Yeah, I'm itching to perform. I'm supposed to perform this weekend but it hasn't been announced yet. I'm looking forward to getting to the studio and created music, because I didn't create any in jail. I just wanted to wait until I come home be hungry for the studio. Nadkarni: You're obviously an icon in Philadelphia and that probrably gives you some access to other celebrities in the city. 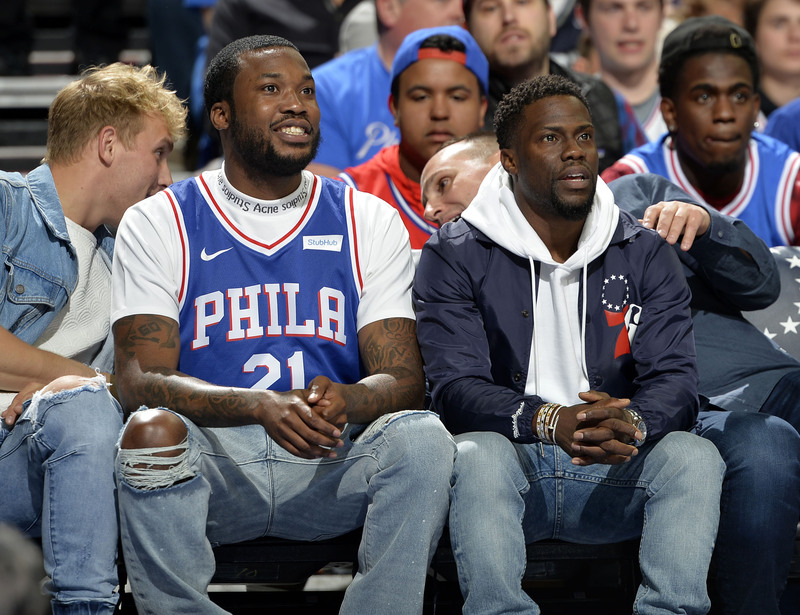 We want to know who's more fun to party with: Kevin Hart or Joel Embiid? Meek Mill: I'm going to have to say Kevin Hart. Kevin Hart is a comedian. It's like you get free comedian services all day. He's just funny as a person. Joel is super fun to hangout with, but Kevin Hart is just funny 24/7. Everything is a joke until the joke's on you. Nadkarni: Have you ever seen Joel drink a Shirley Temple? Does he actually drink those when he goes out? Meek Mill: Oh, yeah, he told people that? I saw Joel Embiid order 35 wings years ago. I've never seen that happen before, but he's big. Dollinger: Who is the most surprising person to reach out to you? I know a lot of high-profile people have been supporting you. Dollinger: We know you're still catching up, but what did you think of Donald Glover's new video, This Is America? It's the hottest video until you drop your first one, obviously, but it's blowing up. Meek Mill: I think it's super dope. His took his creativity to another level and didn't compromise what he thought was artistic. Because when you do certain videos and you putting it on mainstream levels, you got to watch the things that you do and the way you create images because they can be offensive to people but it's real life. He's social forecasting and showing you in so many decoded messages what's going on in America and I like it a lot. I think it's very artistic. I think it's actually the best video out. Nadkarni: Kind of building that, we've heard you say that you don't want people's pity. Now that you're in this position you want to advance the conversation. What's the biggest thing you want to accomplish with this platform? What are the goals that you kind of want to set for yourself moving forward? Meek Mill: Save some people from injustices. I was just spending time incarcerated wth men where out of 100, probably 15 of them aren't supposed to be there. Out of 100, 15 of them are really suffering. Fifthteen of them have been kidnapped from their families, locked in rooms, shackled from ankle to feet and eating food we wouldn't give to our dogs because of wrongful convictions and injustices and errors in the system. I just think that's almost like 15 out 100 people dying for no reason. It was bad to see people going through things like that and we hear about it but it's different when you're incarcerated with them people and you have to see it. There's a lot of violence where I come from, where I used to live, but you could be in the car with somebody and he could get out of that car and go into a house and do something terrible, get back in that car and pull off and you get the same time for what he did. You didn't agree with what he did and you actually didn't even want to get out of the car because you might have been in fear yo get out the car. But you might get a life sentence for something he did. That's how the rules are structured. There are some kids that are 18 years old and hanging with the wrong crowd of people, they actually didn't pull a trigger or hurt anybody, they didn't make a decision and they got life in prison. I just think that there's a different way to handle those types of things. And as far as probation, people being on probation for 10-11 years. You don't have to commit a crime while on probation, you can make a mistake. I could walk out of here and if I didn't pay 20 New York traffic tickets and get arrested, that's a violation. Everything is a violation. If you don't have money to pay for probation, it's a violation. You show up to see your probation officer late, it's a violation. Police contact is a violation, not getting a new arrest, police contact. The kids in Starbucks, they had police contact. Even though they dropped the charges against them, that's still a violation if one of them happened to be on probation. There are just policies and rules that I think I can help change. The governor [Tom Wolf] already started and presented a package of eight laws that he's trying to change in a timely manner. So I'm just using my abilities to help and using my platform. Which Franchise Has the Brighter Future: 76ers or Celtics?